Heat styling and bleaching are two of the worst things that you can do to your hair. But many people do this and cause damage to hair. Curling, straightening and crimping can damage your hair. But at times you need to style your hair. Styling your hair with heat can make it look amazing. But heat can cause damage to your hair and this fact cannot be ignored. So, it is important that you protect your hair from heat. By protecting your hair from the harmful effects of heat, you can style your hair in whatever way you want. Using the heat protectant is the best way to protect your hair from heat styling. What is a Heat Protectant? A protectant helps in adding moisture to your hair and forming a protective barrier that reduces the loss of moisture when you apply heat to your hair. The protectants that you buy from the store are generally made with a formula that includes the combination of two silicones, which are cyclomethicone and dimethicone. Cyclomethicone moisturizes your hair while dimethicone coats your hair. This way your hair is made smooth and loss of moisture is prevented. Dimethicone is an important ingredient in most of the conditioners, leave-in products and detanglers. This makes your hair smooth and looking shiny. Heat protectants make your hair less frizzy and less porous by smoothing the cuticles on your hair shaft. It restores the moisture to your hair. Your hair needs to be moisturized constantly. 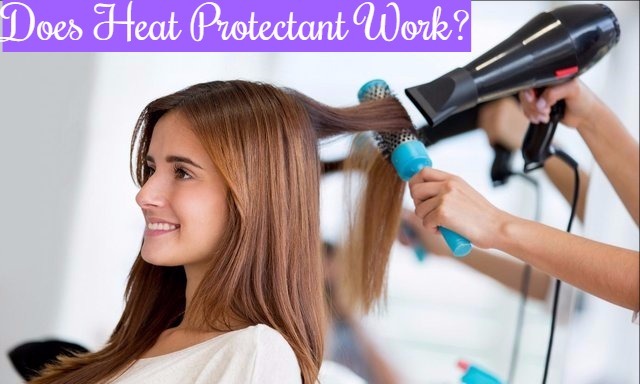 By using a protectant, especially before you heat style your hair, you can keep your hair conditioned in spite of using the heat on your hair. It prevents moisture from getting lost by forming a protective layer o your hair shaft. This way the moisture loss due to various factors like dehydration, dry environment and heat is reduced. It lubricates your hair and makes your hair more manageable. As a result, you will be able to detangle it easily and it also feels great to touch. Which is the best heat protectant for your hair? Alcohol acts as a base for the ingredients to stay dissolved in. It evaporates once it is sprayed. Although alcohol can protect your hair from heat to some extent, it can make your hair dry once it evaporates from your hair. This can make your hair sticky and crunchy. So, if you have dry hair, alcohol based products may not suit your hair. Your hair will soak this product and stay well nourished. It has the ability to make your hair soft. As you know, your hair is made up of amino acids. When heat is applied to your hair, these are broken down. Hydrolysed wheat protein helps in minimizing the damage, as in this case it is the wheat protein that breaks down and not the protein that is present in your hair. Like silicones, Pvp also helps in forming a coating on your hair and detangling it. This product helps in keeping your hair frizz free after you heat style your hair. It keeps your hair smooth until you wash your hair again. Silicones, commonly dimethicone, form a protective layer on your hair and make your cuticles lie flat. As a result, your hair does not become frizzy. Your everyday conditioner may contain this ingredient. If you have oily hair, use heat protectant with minimum silicone as it can build up and make your hair greasy and flat. Avocado helps in keeping your hair well nourished and moisturized. It is also a good natural sunscreen and protects your hair from heat and damage. You can combine this oil with other oils such as grape seed oil and coconut oil for best results. Coconut is one of the best ingredients for your hair. It has the ability to penetrate deep into your hair follicles and moisturize it. With its cooling nature, coconut oil also helps in soothing your scalp and hair in summer. Grape seed oil has a very high smoking point. This means that it has the ability to keep too much heat from getting to your hair. It also forms a protective layer that can limit the hot styling tool from getting in contact with your hair. Olive oil is great for your hair. It can make your hair super soft. It is rich in vitamins and antioxidants, and keeps your hair well nourished and healthy. It is also a good heat protectant and coats your hair, minimizing heat damage. Sunflower oil also has a high smoking point like grape seed oil. It is great for using as a heat protectant. It also conditions you hair and makes your hair smooth and shiny, while not weighing your hair down. How to Use a Heat Protectant for Styling Your Hair? Applying the heat protectant while your hair is still damp gives you the best results. Heat proetctant works best on conditioned hair because it enables hair to absorb the protectant in a better way. Once your hair is dry, you can begin styling your hair. It is important that you use tools of good quality, with ceramic or tourmaline plates. This helps in minimizing the damage. If your hair is dry, apply the heat protectant when your hair is still wet and then follow it with a good conditioning serum before you start styling your hair. Remember not to style your hair when it is still wet. How to protect your hair from heat damage naturally? Use good quality hair styling tools even if they are expensive. It is essential that you use good heat styling tools with ceramic or tourmaline plates and an adjustable heat setting. For fine hair use low temperatures as it does not require a lot of heat. Start at the lowest heat setting and then work your way up to find the right temperature for your hair. Make sure that you do not use temperatures that go over 275-300 degrees Fahrenheit. Weekly hair mask and oiling are a must for your hair. These help in keeping your hair healthy and in good condition. If you barely use heat styling tools, get the help of a professional t do it.